"The World Health Organization blames millions of deaths a year on inadequate fruit and vegetable intake. Thankfully, the 2010 USDA Guidelines introduced MyPlate, which caught up with the science and recommended a shift to a plant-based diet that emphasizes fruits and vegetables. But based on the 2005 Dietary Guidelines, 9 out of 10 Americans did not reach the minimum recommended daily serving for vegetables. In terms of nutrients per calorie, vegetables are the healthiest food source (greens especially). And variety is important because different vegetables have different phytonutrients." "Over the years, countless people have told me that by switching to a plant-based diet, they feel so much better. It's very satisfying to eat healthful food. It's delicious on your palate, and you can feel the goodness of the nutrients it contains. Unlike junk food, whole plant foods don't catch up with you later, making you feel bloated or nauseated. The food is good at the point of contact, and it continues to be good as it travels all the way through your system. Here are some super-special plants you can eat. These eight foods are just a sampling of how plant-based foods contain unexpected healing powers." A new study from the Harvard School of Public Health reveals that, counter to what low-carb enthusiasts would have you believe, eating whole grains improves health and may even help you live longer. 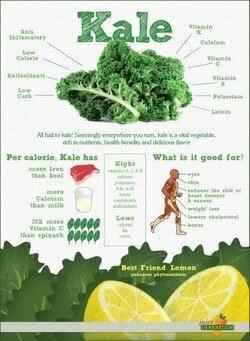 The effect of kale juice on LDL and HDL cholesterol and the antioxidant capacity of the blood. Your parents knew what was up when they told you to eat your broccoli. This verdant vegetable is a powerhouse of nutrients. It's reputed to benefit digestion, the cardiovascular system and the immune system, and to have anti-inflammatory and even cancer-preventing properties. The most powerful natural inducer of our liver's detoxifying enzyme system is sulforaphane, a phytonutrient produced by broccoli. Growing your own broccoli sprouts. What Are Bell Peppers Good For? Food Fact: Bell peppers have more than their share of vitamins & minerals. "Cauliflower is a member of the cruciferous family of vegetables, often overshadowed by its green cousin broccoli. This is one vegetable that deserves a regular rotation in your diet, however, as it contains an impressive array of nutrients, including vitamins, minerals, antioxidants, and other phytochemicals." Click Here for the article by Dr Mercola. "The results of many experimental studies show that green foods have marked beneficial effects on cholesterol, blood pressure, immune response and cancer prevention. 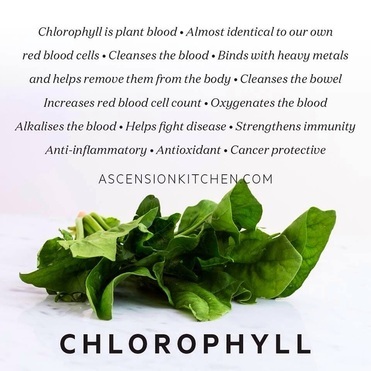 These effects are attributed in part to their high concentrations of chlorophyll." ﻿Eat Avocado to Prevent and/or Reverse Cardiovascular Disease, Diabetes and Cancer! Read the article and get more nutritional facts about the avocado at Article of Health by Clicking Here. "Persin, a natural toxin found in avocados, appears so effective at killing breast cancer cells that it is being considered as a chemotherapy agent." "U.S. adults who consume avocado average some important nutrient benefits, including intake of more potassium, vitamin K, vitamin E, fiber, magnesium, and monounsaturated fat... In addition to these conventional nutrients, avocados offer a wide range of phytonutrients that are related to their unusual fat quality." "Avocados are the darling of the produce section. They’re the go-to ingredient for guacamole dips at parties. And they're also turning up in everything from salads and wraps to smoothies and even brownies. So what, exactly, makes this pear-shaped berry (yes, that’s right!) such a super food?"